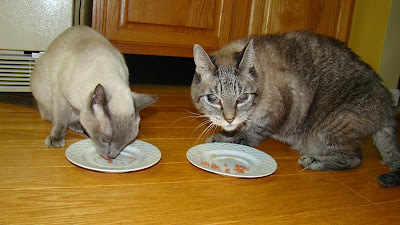 The Spoiled Cat Chronicles at meezers.com: Breakfast time! I woke up this morning thinking about Patrick. We got up and looked at his bed, expecting to find him, but Patrick wasn't in it. The search started and we looked all over, eventually finding him downstairs, waiting for his breakfast. He hasn't come down for breakfast in a few days. I think this is a sign that the fluids are working and he may be getting back to his old self, at least a little bit. Patrick scarfed down his food and then turned his attention to Gato’s plate. We had to steer him back to his own plate a few times. Patrick is a habitual food bully, so I think this is another good sign his old personality is coming back. Stanley focused quietly on his food and ignored what was happening across the room. It's very nice to have met all of you, and to include us in your blogroll. To having adopted older meezers, knowing they have medical conditions, that's very kind of you. And, for Gato to kindly accept them into her household. We hope Patrick continues to improve, and the same for Stanley.